We all strive to be healthier. At least the majority of the people I speak in front of, or train, whether that be a company or corporate entity, organisation or coaching clients. We inherently know that our health is our greatest wealth and yet many of us are not living optimally. I continually say that if you want to be the best leader you can be – and truth be told, we are all leaders, even if all you are ever leading is yourself – then you must first be able to lead yourself. And you can only lead yourself at the best level possible, if you are “on point” – mentally, physically, emotionally and spiritually. There is so much conflicting information out there about how to go about doing this really. At least, that’s what I’ve found. I’ve also found some common threads. In fact, these common threads are what lead me to formulate my Leadership B.E.A.T. Model which you can learn more about by joining the 30,000+ others and watch the TEDx talk here: https://youtu.be/iQWGgO4pWy4. And if you want a fuller understanding of the B.E.A.T. Model, and how to get the best out of it then you can do that here: http://thethoughtgym.com/superenergy. But for now, I want to share something simple, easy to remember and grasp with you that will help you own your health and ultimately, your life. As I mentioned, common threads can be seen when you read and research enough on health. That’s what the B.E.A.T. Model is. In this post though, I’m going to share with you a simple way to think about what you need to consume in your body for optimal health. And the clue is this one word. I want you to O.W.N. 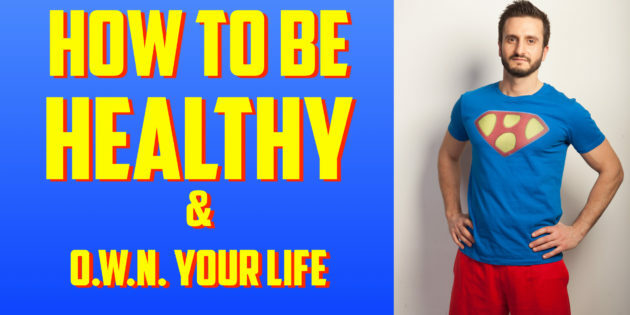 your health and your life. The word O.W.N. means something. Three things to take note of and optimise each day. Every health practice I’ve come across worth anything talks about the power and importance of breath. Whether you practice yoga, tai chi, qi qong or do anything athletic you’ll understand that you need the breath. Most people don’t breath correctly though. Shallow breaths into the chest is what most people in my observational experience do. This stimulates the sympathetic nervous system (fight/flight/freeze) and puts you into a state of stress. Not to mention you don’t use the full lung capacity available to you. Our cells first and foremost need oxygen (air) to survive and really thrive. Without enough oxygen, it’s been postulated by many, that this can cause dis-ease in the body. Our cell’s mitochondria (the powerhouses of the cells) need oxygen to create ATP (energy). Take 10 deep long breaths each morning. In through the nose and out (longer) through the mouth or nose. Breathing out longer helps stimulate the parasympathetic nervous system (rest and digest) and put you in a calm, relaxed and focussed state. If you can, do this also before lunch and dinner. Just 30 deep powerful breaths a day will make a world of difference. Our body is approximately 60% water. And yet almost everyone I encounter does not drink nearly enough good quality water. Or water in general. Opinions differ on how much we should drink, and whether by the time you are thirsty you are already dehydrated, but here’s my view (based on tons of research and experimentation). Half body weight in pounds converted into fluid ounces. So if you weigh 200 lb, then you should drink 100 ounces of water. In metric terms, it’s (4 x body weight)/100. So if you are an 80kg man, you should be looking at 4 x 80 = 320/100 = 3.2 litres. Then you should also look at drinking approximately 1 litre for each hour exercise you might do too. So if that 80kg man is running for 1 hr, he probably wants over 4 litres that day. I won’t go into the intricacies of water, but suffice it to say that if you can get spring water, that’s the best. Avoid plastic bottled water (the plastic leaches into the water), and tap water, although ‘safe’ is not optimal. The average municipal tap water as something like 200 other things in it! If you can filter it, please do. The best filter you can buy. Other options are mineral water, well water, reverse osmosis, alkaline and so on. Right now, just think about getting in the number the equation gives you. Use that number as a guide and if you are currently drinking 1 litre but should be at 3 litres, don’t go straight there. Take a couple of months of gradually increasing it each day. 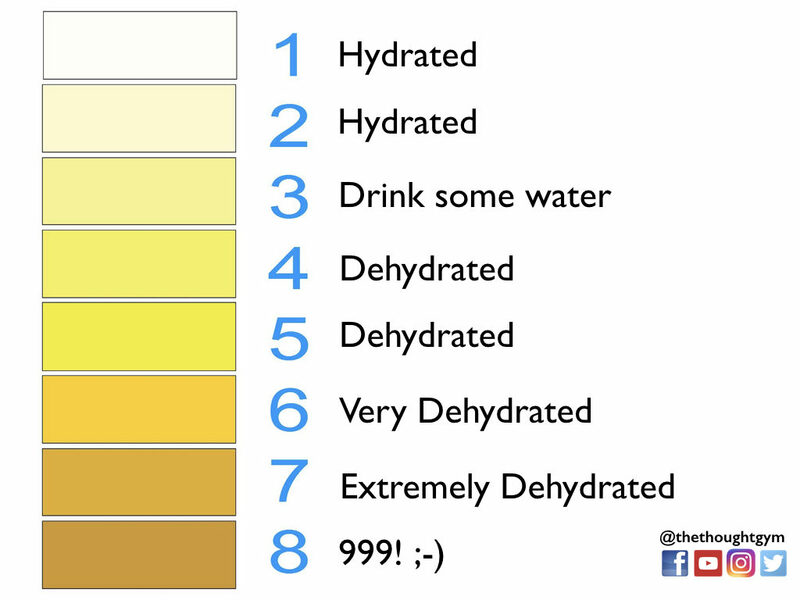 Ultimately, this is how I determine if I’m dehydrated or not. Is my pee clear? It might have a slight tinge to it when in the bowl, but as it comes out, it’s looking very clear. If not, then you need to drink up! It’s a really easy and simple way to understand your body’s need at the time. We should be looking at getting a range of great nutrients into our body, and onto it, each day. These nutrients come from high quality nutrients dense foods (like lots of vegetables, some fruit, possibly some clean animal proteins), but also sunlight (for Vitamin D) and also the earth (anti-oxidants from negative ions on the earth – see my post here for more on that http://harikalymnios.com/book-of-the-month-the-most-important-health-discovery-ever). If it came in a box, packet, wrapper. Probably best don’t eat it. If it came with instructions or a food list with more ingredients than fingers on your hand, probably don’t eat it. If it’s build for shelf life, instead of self life, don’t eat it. If it has a marketing campaign, celebrity endorsement or ad spot, probably don’t eat it. The vast majority (80-90% +) of your food should be REAL! If it was made in a plant and not by plants, then best not eat it. I don’t think I can put it any more simply than that. That alone will save you weeks of lots time in research. Don’t get bogged down in the detail (and there’s plenty of that, trust me!). For most people, what will get them 80%,90% of the way there, is simply to eat a variety of real food with high nutrient density. That’s essentially it. O.W.N. your health, by daily thinking about oxygen, water and nutrients. Make sure your day is OWNed by you. Get quality breathing in each day. Lots of clean water, and a focus on nutrient dense food, and light and earth. Let me know what you think about this way to focus on your health. Would love to hear from you, so get in touch today.